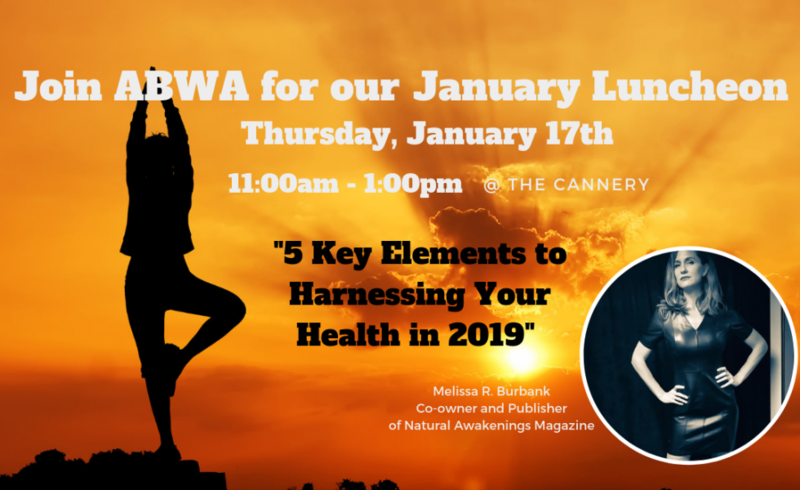 The next American Business Women’s Association (ABWA) luncheon on Thursday, January 17th will feature Melissa R. Burbank, Owner and Publisher of Natural Awakenings Magazine New Orleans and NOLA Fitness Magazine. She is also the Founder/CKO of KICK LLC, New Orleans newest boutique kickboxing studio, located Uptown and opening in January 2019. KICK was created to empower the women of New Orleans. Her presentation is titled “5 Key Elements to Harnessing Your Health in 2019″. Ms. Burbank will discuss what she believes to be the five essential elements to health, highlighting some quick and easy life hacks to implement them in your everyday life. As a cherry on top, she will also cover several bonus elements for a healthier lifestyle that are sure to bring a smile to your face. Culminating in a discussion on how these elements of self-care can harness your power as a woman from within to finally take control of your life and transform how you live forever. Live your life, your best life. Melissa Burbank was born-and-raised in New Orleans. After attending Benjamin Franklin High School, she received her B.S. in Marketing and then went on to complete her M.B.A. at Tulane University. Melissa is the Owner and Publisher of Natural Awakenings Magazine New Orleans and NOLA Fitness Magazine. She is also the Founder/CKO of KICK LLC, New Orleans newest boutique kickboxing studio, located Uptown and opening in January 2019. KICK was created to empower the women of New Orleans. She is dedicated to fostering community partnerships via the publications to give a voice to those that encourage a cleaner, greener, healthier lifestyle here in New Orleans earning her the Leadership Award in the Buy Local category of the Love Your City Awards in 2018. Melissa loves to share her passion for New Orleans with others which has led to her earning the coveted status of a “Superhost” with Airbnb. Finally, she is currently embarking on her biggest project yet: opening KICK, a boutique kickboxing studio on Freret Street, in which she hopes to empower women to feel stronger, more confident, and more balanced, not only in their own physical fitness, but throughout every aspect of their lives. She currently lives Uptown in the Carrolton area with her 10-year-old son, their black lab, and new baby kitten. She enjoys her morning meditation, staying fit through yoga, pilates, running, and kickboxing, as well as traveling and photography.